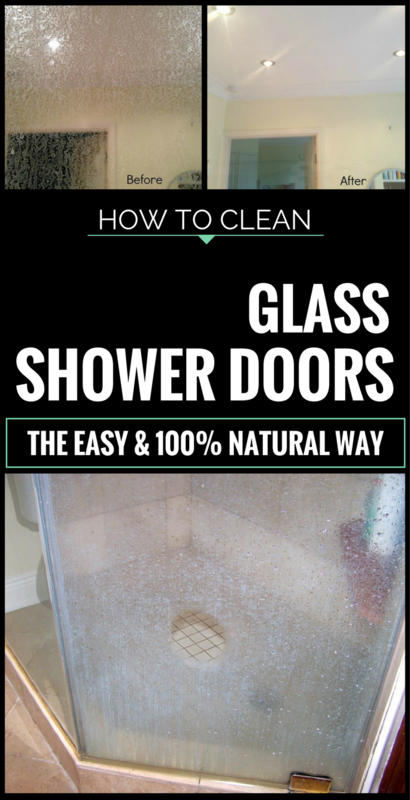 Glass shower doors are very beautiful in any bathroom, but they are very hard to clean, because every drop of hard water is seen on them, and the soap film is very hard to remove. At least this is what they say, because I’ve tried some natural ingredients from my pantry, and this job turn out in being very easy to do. Those white spots from your shower cabin are nothing but soap film and limestone. Limestone appears because of hard tap water, and the easiest solution to remove them is to use a gentle acid mixture that doesn’t attack the glass, and at the same time to melt the soap film particles. If limestone and rust stains are old and hard to clean, the easiest solution is to mix a few tablespoons of baking soda with vinegar to obtain a paste. Apply the paste all over the stained area and let it for 10 minutes. Use the green side of a dish sponge to rub gently the glass surface, and then risne with lukewarm water.